The studio is finally ready to be wired for electricity! That’ll get me one step closer to having an actual functional work space, and it’s a huge step towards getting this room completely finished. I’ve had quite a few people (enough to surprise me) ask me to talk about basic wiring. Let me be clear that I’m not going to give you a tutorial on how to wire your house for electricity. There’s too much liability involved in that, and you really need to check your local building codes, permit requirements, etc., before tackling a job involving electricity. And if you feel like it’s over your head, even if you have a permit in hand, please, please, for the love of safety and life itself, hire a professional. But I do think knowledge is power, and once the mystery of electrical wiring was explained to me, I felt like I had a much stronger working knowledge of how my whole house works. I love how empowered I feel each time one of these mysteries — house framing, electrical, plumbing, window installation — becomes less mysterious to me and I actual understand how everything works. Understanding these things also helps when talking to contractors and subs so that you can better understand what they’re talking about, better communicate problems with them, and possibly know more about what’s involved in fixing problems so that you won’t be easily ripped off. Knowledge is power, my friends. So let’s start with some electrical basics, shall we? Totally scary and intimidating, right? 😀 That’s only until you know what you’re looking at. Then it’s way less scary (but no less dangerous — be very careful where you put your hands!!). At the top, you’ll notice two super thick black wires coming down and attaching to two rather large connector nut thingies. (I’m pretty sure that’s the technical term. 😀 ) Those big wires are coming in from outside and supplying electricity to my entire house. My house has 200 amp service, which means that at any given time, I can be using 200 amps of power, which would never happen. So my 200 amp service to my house could supply electricity for almost 1200 table lamps all turned on at the same time. Or I could use my hair dryer, clothes dryer, and vacuum cleaner at the same time, and still have enough amps left to power over 800 single-bulb table lamps with LED bulbs. Well, that’s because not all of those 200 amps of electricity are available to all areas of your house. And that’s where “circuits” come in. If you look at my circuit breaker once again, you’ll see two columns of thin black things with wires running to them, and each of them is labeled with 15amp, or 20amp, or 30amp, or 50amp, etc. 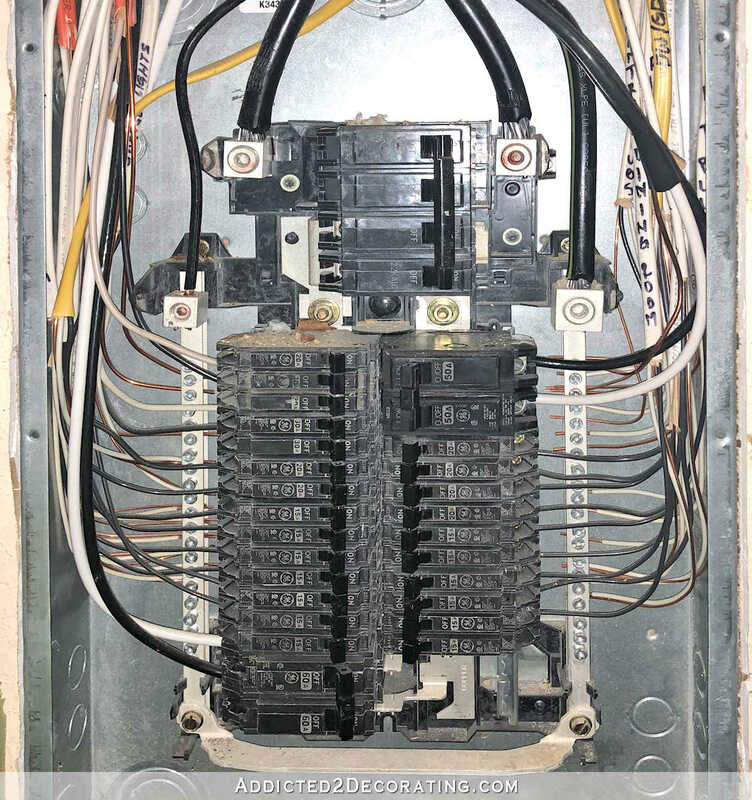 Those are the circuit breakers, and each circuit breaker provides a specific amount of amps to a specific room or a specific area of your home. The most common circuit breakers used are 15 amps and 20 amps, although things like clothes dryers and HVAC systems require dedicated circuit breakers that are much bigger (around 30-60 amps each, depending on the what the circuit is supplying electricity for). So while my 200 amp service could certainly power a clothes dryer, a hair dryer, a vacuum cleaner, and 800 table lamps at once, I wouldn’t be able to do that all in my living room since my living room only has 20 amps available to it via one circuit breaker. So I’d have to use the hair dryer in the bathroom, the vacuum cleaner in the living room, the clothes dryer in the sunroom, and the lamps spread out evenly throughout the house. So in a nutshell, an electrical circuit is simply a series of outlets and/or switches that are all powered via one circuit breaker. And even if you never do any electrical work in your own house, it’s still good to have a general idea of the circuits in your home so that you’ll know if you can plug in your table saw and your air compressor and be using those things while your someone else is running the shop vac. Now that we understand circuits, I’ll show you how I planned my circuits for the studio, half bath, mudroom, and carport. The first step was to draw out the room. I used both a floor plan and elevation drawings to get an idea of where I wanted everything. 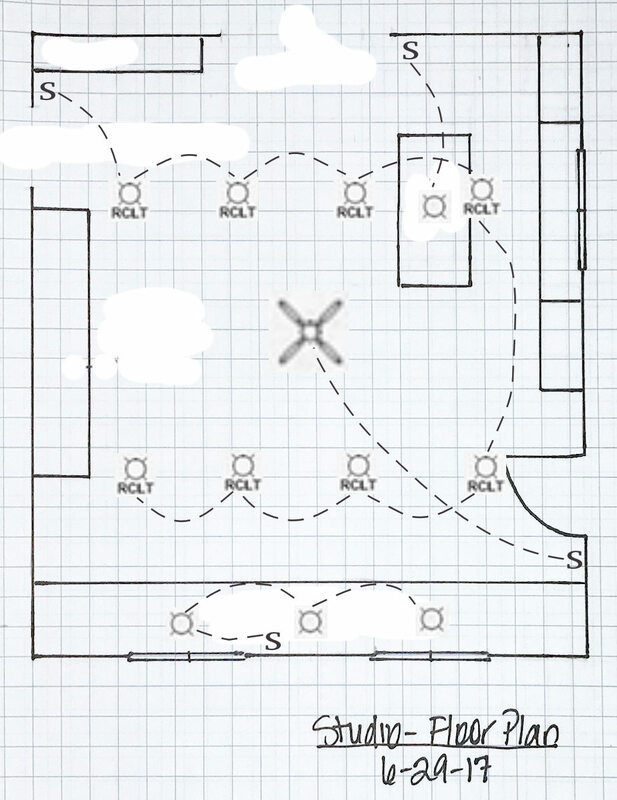 I used my floor plan drawing to plan out the ceiling lights, ceiling fan, and pendant lights, and to determine where all of those things will be switched. I personally hate three-way lighting (i.e., a light that can be controlled by two different switches, generally on opposite sides of the room), but code also requires that you be able to step into a room and flip a switch for lighting before you actually have to walk through the room. So I made my recessed lights switched at the breakfast room doorway, and the ceiling fan with light switched at the portico door. 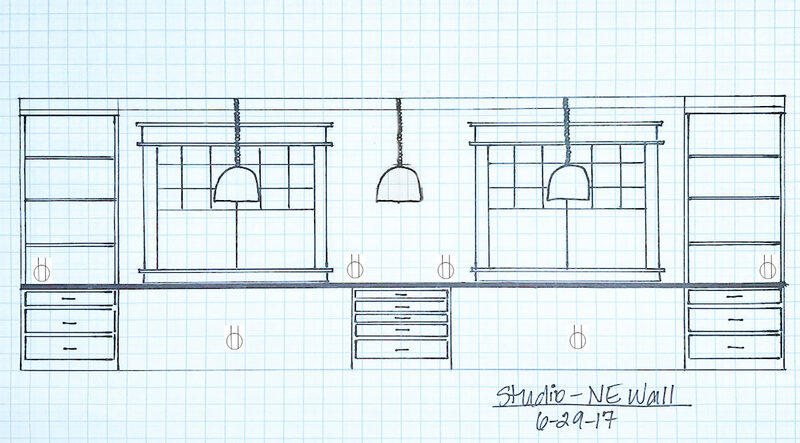 The other pendant lights are just additional task lighting. And then I used my elevation drawings of each wall to determine where I wanted my electrical outlets. Some of these things are determined by code requirements. For example, on a long stretch of wall, you need to have an outlet at least every 12 feet. And if you have a wall space at least two feet wide, you’re supposed to have an outlet. Other placements are determined by how I’ll use the room. For example, I might want to keep chargeable tools inside the cabinets, so I’ll need an outlet. I might want to put a printer in a lower cabinet in my “office” area, so I’ll need an outlet for that. It’s important to really take time to think through all of the ways that you’ll use a room, and even plan for possibilities that might not be relevant right now. I don’t actually have any rechargeable tools right now, but I might in the future. Or I might use those outlets to install some in-cabinet LED tape lighting in the future. We’ll see. But at least I know those outlets will be available to me if/when I need them. My studio list was quite long, so I’ll spare you the rest. 🙂 But after I had my very exhaustive list written, sectioned out by rooms, and I also had my drawings in front of me, I was then ready to plan out my circuits. Some circuits are determined by code. I found this article to be very helpful. Beyond that, it’s just a matter of determining how the room will be used, and how many things you think might be plugged in and used at the same time. For example, a workshop that is filled with power tools, and that is used by more than one person at a time might require several circuits just for that one shop. But your home library that’s filled with books, where you go to read and get away from it all, and where the most powerful thing used might be a vacuum cleaner once a week, would probably be fine with one 20-amp circuit powering the whole room, including lights and outlets. So circuits are determined in part by code, but also by how the room will be used. 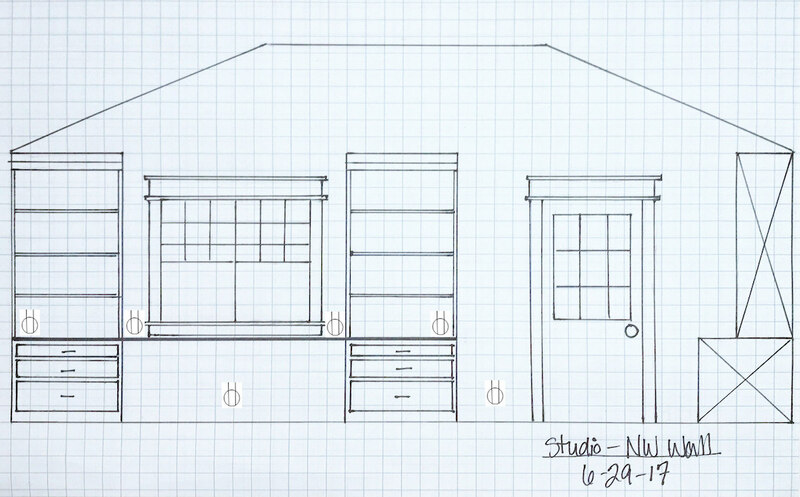 Using my exhaustive list and my drawings, I determined that my carport, half bath, mudroom, and studio, as well as the portico light and the four outlets I want to put on the exterior of the studio, will take a total of five 20-amp circuits. Since I already have one circuit breaker in my breaker box labeled “garage receptacles” and another labeled “garage lights” and neither of those is currently being used (and haven’t since the garage-to-studio conversion started), I can reuse those. So I’ll have to add three new circuit breakers to my box. That means that each one of those circuit breakers will have a long electrical wire (called conductors) going from the circuit breaker in the guest bedroom closet, up into the attic, across the whole width of the attic, and down into the studio (or half bath, or carport) to power the specific circuit (or series of outlets and/or switches). The general rule of thumb is to have around 10 outlets on a circuit (again, depending on how they’ll be used). You’ll notice I have more than that on Circuit 5, but I’m okay with that because, quite frankly, some of those outlets probably will never be used, and the things I do have planned for that area (cell phone charger, printer, laptop computer, desk light) use very little electricity. So I’m adding the additional outlets just in case. I asked my brother, “Can you think of any reason I’d need an outlet in the closet?” He responded, “Yes. Because if you don’t have one in there, you’ll wish you had one because you’ll need it. But if you go ahead and put one in there now, you’ll probably never need it.” 😀 Yep. Same concept for several of the outlets I’ve listed above. I suggest you add a “pull down” outlet over your work table area…because it comes in handy more times than I can count. Nothing worse than having to use extension cords. Thank you! This is so helpful! One question – you said that you’ll have to add 4 new circuit breakers to your box. How does adding 4 additional 20’s to your box work relative to the total of 200. I feel like if I add up all of the existing 15’s and 20’s that I see in your current box, it already totals to more than 200. So, how much over 200 can you be? At what point do you need to add another box? For example, we have a pool, which has it’s own box. Since we bought the house that way, I never really bothered to learn at what point you determine you need another box. PS I totally get your concerns about liability. I’m glad you didn’t go there. I think I didn’t explain that clearly, so I reworded the post. The total number of amps on all of the circuit breakers can be (and generally will be) much higher than the total amps you have coming into your home. But in a typical residential home, unless you have a very active family of 20 people living with you who are always vacuuming, blow drying their hair, doing laundry, etc., you’ll never require all of those 200 amps at once. You can add as many circuit breakers as you need to feed different areas of your home (although circuit breaker panels can only hold a certain amount of circuit breakers, so if you use up all of the spaces, you’ll have to add a second breaker box). But the important thing is how much electricity is being used on any circuit at any given time. 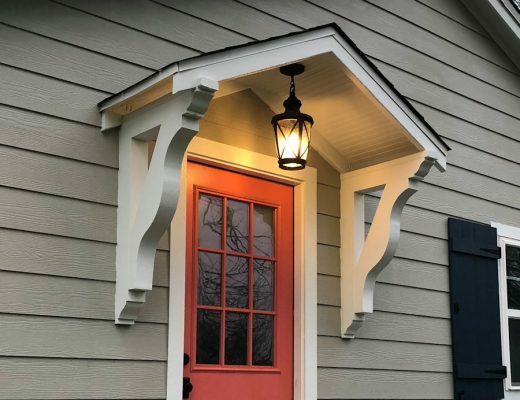 If you have a relatively new home, or an old home with updated wiring, the amount of electricity used in any given room is generally not something that you’ll even have to think about, because it will be set up to service any of your normal, day-to-day activities that you do. 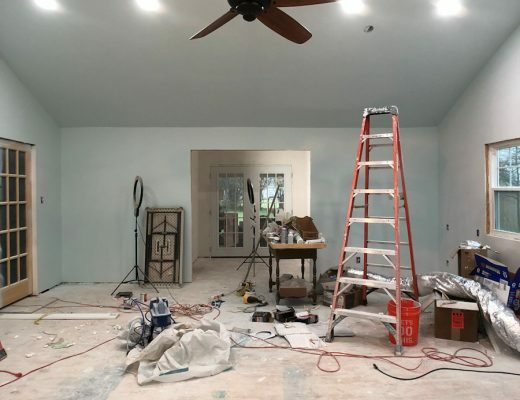 Exceptions may be situations like a garage that you’ve turned into a workshop, where you and another person are using power tools at the same time. In situations like that, an additional circuit may need to be added. You did say that! LOL! I’m just having a hard time wrapping my brain around it! Sorry to make you repeat yourself. Maybe because I think electricity is so scary, I wanted there to be some hard and fast rules about # of breakers in a box. But what you’re saying is that it really comes down to how you use the total 200 amps that come into your house. When would you have to have an additional circuit box added? And boy is that code different then when my house was built!! I’ve upgraded a lot of the wiring but it seems there is always more I could use and that is because the walls don’t have as many outlet boxes as now required. I know what you mean! My house is 100; most of my rooms have only one outlet and the light switch is clear across the room from the doorway! Very helpful info, Kristi! I love being empowered by knowing more about this traditionally guy stuff! As a general rule, an additional circuit breaker box would need to be added only when you fill up the first one. Those boxes come in different sizes, but they all have a limit to the number of circuit breakers they’ll hold. Fill up one, and then you have to add another. Now I don’t know for sure, but I would imagine that there might be other specific circumstances that require a second and separate circuit breaker even if the first one still has space. I’m thinking about areas like swimming pools and hot tubs where I can imagine that code might require some sort of quick access power cutoff within a certain distance of the pool. But I’m just guessing at that, only to say that there might be specific instances where a second box is necessary regardless of empty spaces in the original box. Kristi you would have been a fantastic teacher if you had chosen that career path. I use to have a wonderful boss who taught me that when you are writing or giving verbal instructions always gear it towards a seventh grade student. He wasn’t implying that people are stupid, but that everyone is comfortable with that level of teaching. When you get “wordy” you lose people and they shut down and lose interest in what you are trying to explain to them. Congratulation Ms. Kristi get you get an A+! I was going to say the same thing! I have rewired my entire house and I understand a great deal about electrical wiring, but Kristi explains it so well! Very interesting, thanks for the explanation. I would need to take an electrical class to even consider doing in wiring of my own but your post at least will allow me to speak more clearly to an electrician. Might want to add something about GFCIs and when code requires those. I’ll be sure to add that info in a subsequent post when I actually add the outlets. Right now I’m just trying to get circuits and conductors in place so drywall can go up. I’ll add the actual outlets and switches after the room is dry walled. Thanks so much, Kristi, for sharing your projects! I have just finished building a new home and referred to your posts for many of the projects that I finished myself. I still have lots more projects (pantry shelving/cabinets are next). I think you made the right decision by doing the wiring yourself. I reluctantly turned over some things to my contractor and regretted them as soon as I saw the results. I am not a professional, but would have done a better job on some things because it is MY home and I care. Too often, the subcontractors are just trying to get the job done as quickly as possible and do not take the extra care and pride in their work that they should. Not to even mention how much they charged to do such a poor job! Thank you for teaching me something today that I never understood a thing about. I love learning from you! Thank you for sharing your knowledge. This is good info. While I am not planning on wiring my house, I think we should all know basic electrical. We all should be able to install a light fixture, ceiling fan or change an outlet and know enough not to get ripped off. Sounds like you have this all planned out in detail. Should be a workable plan with room for growth, if needed. I am no electrician, however, I’m thinking having the bathroom lights on the same circuit as the bathroom outlets is a no no, per the NEC. Of course, it depends based on which version of the NEC that has been adopted by your city. If something is amiss, I’m sure the electrical inspector will let you know. Ugh. I’ll have to look that up. I thought one 20-amp circuit could feed both as long as that circuit is dedicated specifically to the bathroom and doesn’t feed a single thing outside of that bathroom. Thank you soooo much for this post. I am now, however, in fetal position and will hire someone when I need electrical done. LOL!! Whew! Glad my husband knows this stuff, because my head can’t grasp all of it! Anything “technical” just sends me in to la-la land for some reason. In my head, I have my fingers stuck in my ears saying La-La-La-La-La!!! I still worry that he does not in fact, know EXACTLY what he’s doing, but he always has someone knowledgeable check his work, and we haven’t had any mishaps in 40+ years, so I guess he knows! I will leave it to those who know, and I will stick to things I know. But I am impressed that you have learned all of this gobble-de-gook! LOL! Oh my goodness. Where are you right now? I need to know where to deliver the hug! Oh, yay! I’m so glad you found it helpful! And I’m sure I was crawling around in my attic when you commented, so yes. I could have used a hug. 😀 I hate having to get in my attic. Kristi, I hope that after you get your house done, and if you opt out of becoming an HGTV superstar, that you might consider becoming a general contractor + interior designer so people could hire you for big and/or small remodel jobs. I’ve been looking at real estate in southern California and of course can’t afford anything unless I win the Lotto or a Brinks truck crashes into my living room, and am dreading the idea that I might have to go with a foreclosure someday if I want to buy anything here. I would actually consider buying a foreclosure or something that needed fixed up if I had a Kristi I could hire! I believe that building trades often purposely set out to overcharge people, especially women (that was my mom’s experience) and having a woman in a the industry, especially an honest, knowledgeable one, would be heaven-sent and a great source of relief from worry. Just a thought! I would LOVE to be a general contractor. I agree that more women are needed in that field. We women have unique perspectives and (in my humble opinion) sharper eyes for details that men who work as contractors just don’t have. Your drawings are fantastic! The only change I would consider making is for the outlets below the counter. You have one outlet in the center of each space. I think it would be better to put the outlet off to the side or even have one outlet at each side of the space. If someone is sitting there, the tendency is to sit in the center and any cords will then be in the ways of her legs and easy to get tangled in or to knock about. There are also aesthetic reasons, at least to my mind. an outlet tot he side is less visually instrusive. Were I to put a printer under the counter, I would push it to one side rather than have it in the middle. It will look better to have the cords hidden behind the printer stand rather than reaching out to an outlet in the middle. I actually mentioned that (in my very wordy post, so you probably missed it 😀 ). I hate three-way switches, and I avoid the if at all possible. I have some OCD tendencies, and I like my switches to be down for off, and up for on. With three-way switches, they get all mixed up, then you’ve got one that’s off on up, and down for on. I can’t take it. I know it sound stupid, but it’s one of those things that bugs me. I actually wired a three-way switch for the chandelier in the breakfast room, and I found that I never used it because I couldn’t stand the though of the up/down to get messed up. Hey we all have our own little quirks, we knew someone who didn’t like switches or plugs visible. You keep amazing me in the things you do….Your blog is the best and I keep talking about you to whoever will listen…Can’t wait for more to come…HUGS…hope you still need one!!! The next step after wiring will be insulation and I wanted to put my two cents worth in before you ordered material. Having used both fibreglass as well as the new Roxul Brand Mineral insulation I will never use anything other than Roxul again. 1. It says use gloves, long sleeves etc like fibreglass does but I usually just use gloves and have never been plagued by tiny glass slivers like fibreglass. 2. It so firm and compacted that when you cut it it stays intact (cut with a special fibreglass knife or simply a serrated bread knife). One person can easily put it between studs and it fill the cavity and stays right where you put it. (Doesn’t slump like fibreglass) 3. It stays so well one person can even put it between ceiling joists. 4. It is a higher R value than than fibreglass as well as a higher fire rating. 4. There are 2 types, Safe and Sound that has a higher fireproof rating and is a sound barrier. 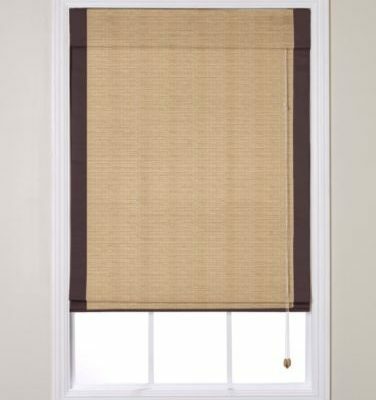 This is great for interior walls. Or the regular high R value for exterior walls. I have absolutely no financial connection to the Roxul company. I just wanted to save you a whole lot of time and labour. Try one batt to see the difference if you haven’t used it before. Slightly higher priced that the old stuff but decreased labour more than makes up for it. The biggest benefit though is how comfortable your room will be and how much cheaper your heat and air conditioning will be. Thank you! Matt and I were just discussing insulation yesterday. He wanted spray foam, but I want to save money. 🙂 I had completely forgotten about Roxul, but this seems like a good compromise between the fiberglass and spray foam. Plus, I actually have used it before, and I love how it doesn’t irritate the skin. I actually used the Safe and Sound insulation to fill the cavities in my bathtub. For my hallway bathroom remodel, I just bought one of those inexpensive, molded tubs with the hollow sides, and when shower water hits that, I hate hollow sound it makes. So I stuffed the cavities with the Safe and Sound insulation, and it worked perfectly to eliminate that awful sound. As I’m fluent in “thingymajig” this blog was hugely helpful! Thanks for taking the time to break it down into more comprehensible language. Good luck. Kristi, this was such an excellent post. Thank you for taking all the time and putting in all that thought for this. Now, as usual, more suggestions for you. 1. Put the ceiling vent fan on a separate switch from its ceiling light. 2. Put in a timer switch for our ceiling fans. You set it for 5 minutes or up to an hour (in 5 min. increments, then it goes off automatically. I really like having the separate switching for the fan and its attached light, by the way. No reason to waste electricity with both coming on during the day, if you just need the fan. Also, the GFIs will be a must in the bathroom. Hope you are checking the latest code requirements for your town before you finish your planning and pull your permit.